Replaces the long lasting and popular 2094 also with vacuum cleaning and blowing ports, as well as cloth bag or paper bag replacements. Fits easily on stair tread for cleaning convenience. The Hoover Portapower Vacuum is one of the most powerful canister vacuums on the market. The Portapowr CH30000, originally called the Hoover C2094, is manufactured with commercial strength at a residential reasonable price. This canister vacuum is phenomenal for vacuuming your hardwood floors, tile, cars, stairs, blinds, curtains, upholstery and many other areas in your home or office. The Hoover canister vacuum is light and comes with a shoulder strap to carry easily throughout your cleaning area. 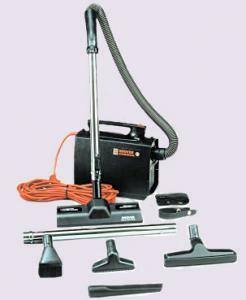 The portapower comes with several tools to allow for all types of cleaning. This canister vacuum comes standard with an easy to empty cloth bag that can be washed weekly to maintain or you can purchase a conversion kit to easily change the unit to use disposable bags. Widely used by cleaning companies for over 30 years and loved by homeowners, the Hoover Portapower will not disappoint. I have bought from you many times and always have had a positive experience. All in All Very Good!